BEVERLY HILLS, Calif. - The swelter is right there on the screen, the insufferable heat unmistakable in the actors' faces and on their sweat-stained shirts. It's one of the first things everyone from the director on down mentions when discussing the making of "The Kingdom," Peter Berg's new terrorist crime-thriller set in Saudi Arabia (but shot mostly with sandy, steamy Arizona as stand-in). Berg ("Friday Night Lights") mentions that actor Jason Bateman ("Arrested Development") passed out several times. Jennifer Garner, a first-time mom who was nursing during filming, talks about her body sending all available nutrients to, well, her breasts, twice landing her in the hospital for dehydration and heat stroke. Jamie Foxx just calls the conditions extreme and exhales hard for emphasis. "It was 130 degrees pretty much every day we were filming," said Berg, who gave the actor in him ("Chicago Hope") a cameo in the movie's opening scenes. "This movie was by far the most intense experience of my life; it was the most intense battle." Three people lost their lives during that battle, according to Berg: a driver who was diagnosed with stomach cancer and told he had a week to live; a construction worker who was hit by a car; and a prop assistant who was in a car crash on set and died in front of the entire crew. The heat pales in comparison, of course, but it's still seared in their collective memory. As Garner put it, "You're out in it so long you can never get cooled back off. Your body just panics." Or as Foxx says about Garner, "She is the iron woman. After having a child, getting back into fighter shape, and then working out in those extreme conditions and never complaining, that's incredible." "The Kingdom" tells an incredible tale based on Berg's fascination with the 1996 Khobar Towers terrorist attack in Saudi Arabia, in which hundreds were wounded and 20 killed, all but one of them Americans. 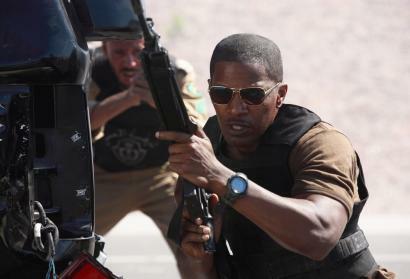 "The Kingdom" sets out to solve a similar crime, sending an elite FBI team secretly into Saudi Arabia and forcing its members (Foxx the team leader, Garner the forensics examiner, Chris Cooper an explosives expert, and Bateman the intelligence analyst and comic relief) to form an alliance with a Saudi prince and an Arab police officer. The politics are more subtle than they sound, although Berg clearly has a point to make about the seemingly intractable cycle of terrorism in the Middle East and beyond. But despite its setting, despite its examination of global issues, politics and political intrigue aren't actually the point of "The Kingdom." A fresh twist on an old-fashioned detective yarn is. There's a crime to solve, and there will be explosions and gunfights and high-speed chases en route. Also some Arabs who might otherwise be seen as enemies are humanized along the way. "Any terrorism is bad, even when it's homegrown: the bombing in Oklahoma City, bombing abortion clinics, bombing, period, killing people for any reason," Foxx said. "But in this movie you get a chance to see someone who lives over there and what gives him the power and strength to go the step further and find out who he really is. It's not about Allah. It's not about God. It's, 'Let's track the bad guy. Let's get him.' "
That would be an emphasis on him, since this, not surprisingly, is a seriously male-dominated action movie. Garner, dressed down almost the entire time in baggy T-shirt and pants, says that's par for the course for her as well as other women in Hollywood. Sure, it was an especially hormonal time for her. Sure, as a new mother she had to sit down and sob after a scene where she had to scare a young girl. But all things considered, the guys were understanding - even if she says Berg did sucker punch her in her Kevlar-covered gut while showing off for the behind-the-scenes camera. "The day [castmate] Frances Fisher showed up I threw my arms around her neck, it was so great to see her, another woman, yes," Garner said. "But it was a blast making this movie. They were great: 'Jennifer has to go pump, Jennifer has to feed the baby . . .' The reason I wanted to make the movie in the first place is that I wanted to work with Pete, as crazy as he is, and I love Jamie Foxx." Foxx's reasons for making "The Kingdom" - for making any movie - are more complicated. Ever since winning the Academy Award for Best Actor for 2004's "Ray," he says he has been avoiding advice to cash in and has kept focused on taking better roles that will lead to a long career. Obviously that doesn't explain "Miami Vice," but even when it comes to comedies, the stand-up comic says any movies he's in have to stand out in the wake of Oscar. "Ellen Barkin told me at a party, 'If you ever chase the money, I will whup your so-and-so,"' Foxx said. "And that's what happens after you win the Oscar. People are saying, 'Go get the money.' But you have got to keep to the lane you created and the lane you created isn't necessarily going to be huge box office, which is what you want. "Of course people send me goofy stuff, too," he added. "They know I'm a comic. It is what it is, and I enjoy movies like 'Superbad' and 'Rush Hour 3.' But I know if I do a movie like that it will be compared to . . ." his voice trails off. "You want to be provocative, you want to be first, you want to have that thing on it." So, Foxx says, he's willing to wait and, anyway, he's got other activities to fill his time. There's the music career. The stand-up comedy career. And now the on-air career. For some three months now, Foxx has had not just his own show but his own comedy channel (106) on Sirius satellite radio: The Foxxhole. As an executive producer, he helps choose comedy bits. As host he does his own, inviting guests ranging from actor Jeremy Piven ("Entourage") to the inexplicable Paris Hilton to have at him and risk being at his mercy in return. In the two hours it airs, he says with genuine gee-whiz awe, the show will receive 2,000 telephone calls from around the world. The conversation, and the questions, can and do go anywhere. He says it's good fun and a great way to kill down time between movies. Meanwhile he's looking for his own roles on the History Channel, Court TV, and the like. He says he watches and wonders: Would that true-life situation work for me movie-wise? He says he wants to find something with funny moments but also something real. He says he could be describing "The Kingdom," which took him not just to Arizona but also to Abu Dhabi and made him confront any stereotypes of his own. "When you see it onscreen, when you see all those explosions, you go "Whoo!" Foxx said. "But there's a story, too, and it's not the Hollywood ending, where here they're walking in the pasture eating hot dogs and apple pie. It's, 'This is the end, that's how it is.' "